Shop ZVEX Vexter Fat Fuzz Factory Germanium Fuzz Pedal from AMS with 0% Interest Payment Plans and Free Shipping. The Vexter Fat Fuzz Factory is a take on the original ZVEX flag ship pedal the Fuzz Factory. 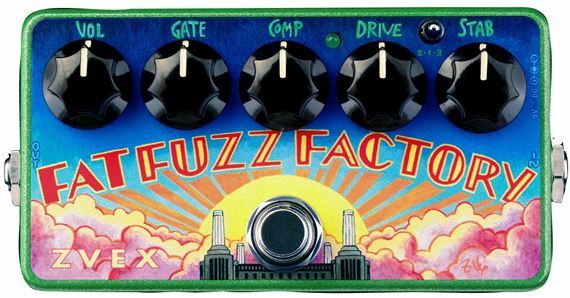 The Fat Fuzz Factory features a sub switch that opens the pedal up to astounding bottom end. This means the pedal can oscillate at much lower registers, giving it some very interesting thunder broom synth qualities. The additional low end makes it the Fat Fuzz Factory as useful for bass guitar as it is on guitar. Drive: Increases distortion when used as a ‘normal’ fuzz and adjusts feedback pitch and tonal thickness. Stab: Use all the way right. Do not adjust this control below 2:00, unless you like your fuzz soft and squishy. Use to control feedback pitch.